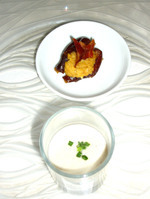 Spain is the birthplace of the modern cuisine; at this point the avant gardists have spread their fingers far and wide here and it is almost easier for a person doing a gastro-tour to find yogurt espuma than fine food born of the local flavors, coaxed and accentuated by the hands of a confident expert. Wife and I came to Spain for the food, maybe a museum or two, but really mostly the food, the new food, the creative and the daring. But first it only made sense to have a truly well made, classic meal stemming from the flavors of the region. Only with a good sounding board would the plays involved in the new cuisine be able to make their appropriate impact. On Calle Moreto, a short walk around the corner from the Prado Museum in Madrid, is Restaurant Balzac. A simple room with that weird feeling preeminent in Europe where you walk into a space decorated sometime in the last 50 years, yet in a neighborhood of buildings that could have easily been built in the last thousand. Well put together and conceptually great, it seems self-conscious and dated but very recently so; a world where the beautiful cut crystal decorating everything looks like it is from ’93, but you know that may just be because the stain on the wood paneling surrounding it is oak rather than natural or cherry. Both could be from yesterday or twenty years ago, you just don’t have the local decorating mags at hand to check. When traveling, we like to try to stay very local with our wine choices, one because of terroir (what grows together goes together), two because it is an ingratiating intro to conversation with the locals, and three because it is most often the best wine for the value. Here we had a blanco from Castilla y Leon, and then just a glass of house tinto when we saw a steak knife arrive in our mis en place. Our two amuse were truffle cream served in a shot glass, and a date with mustard cream and bacon. The truffle cream was thick as if a gelatin had been involved and was very much about the aroma of the other mushrooms in its preparation while the finish was lingering black truffle. The date was pitted and split, with a dollop of the mustard in its center and a small piece of crispy bacon placed on top. The mustard cream was substantial, as if somehow porridge had been made of mustard grains and allowed to simmer to a very thick consistency. Neither hot nor vinegary, it made a good foil for the date’s sweetness while the bacon, shallow in depth, sliced very thinly and cooked to brittle crispness, gave enough salt and smoke to highlight the play between the other two components. The first savory course was a tuna salad. Red tuna seared, sliced, and served with a tomato and garlic purée. There was a mixed green salad with alfalfa sprouts, chopped toasted hazelnuts, and a grassy green olive oil on the plate. The flavor of this tuna was that of the deep sea the tuna hunt in rather than the lighter flavors we have come to associate with the fish. I am not sure if it was born of a preservation process or not, but this tasted both fresh and like fish, with no apologies. Up third was a seared piece of cod. The cod was set atop a rather garlicky pile of tomato concasse that had been mixed through with thyme leaves, toasted pine nuts, chives, and olive oil. It was as if a well-seared and flavorful piece of fish had been asked to step in for the piece of toast in a bruscetta; the ultimate version of those flavors you associate with olive oil, garlic, and seafood dishes that come in terracotta plates at tapas places. Fourth came roast pigeon served on a raisin-apple-pine nut-cinnamon- clove-honey- compote with a red wine, cherry reduction on top and a sweet potato chip. It is nice to be reminded of the Moorish influence on Spain through a dish rather than a tour guide. With meat any less gamey than this pigeon this composition would have been deathly sweet. Not sure if this bird had been hung or not, but it was gamey, just gamey enough to make the combination of flavors perfect. In the stack of meat was a thick, rare piece of breast, a leg that had been prepared confit, and a slice of the roasted liver. I know of few people that would jump at this dish spelled out as I have done it, but I know of less people I dine with regularly that would have not called it the best dish of the eve. Our first dessert was rice pudding. Much looser than the ones I am used to, this had the fennel, licorice, and herb flavors of Pernod, with a dusting of cinnamon and a candied orange slice as garnish. While traveling it is always nice to have some local herbal or bitter digestif. This played that role well, without taking it to that super-boozy place. It just wouldn’t be a trip to Europe without a little chocolate mousse to remind you that, when done well, it is a great, light ending to a meal. At Balzac, a light frothy mousse is topped with some toasted hazelnuts and a canelle of vanilla gelato. Looking to have the food of the place you are visiting all too often turns out to be having something slopped together ham-handedly by a brute with an unending supply of cooking gas, garlic, and cheap olive oil. It is nice to be guided to a great restaurant that makes indigenous food adroitly and confidently without getting lost in what the guidebooks say their food should be. Balzac made us food of local ingredients with local flavor unique to its place in the world, never getting preachy about humbleness or embarrassed for its refinement. Augie, thanks for writing about your dinner at Balzac. I love this place, a bit off the beaten track, but perfect for a post-Prado meal. The staff is very friendly and accomodating (having eaten there a few times, I had to arrange for a 90 person dinner, and several of the diners were very picky or had food allergies). It's great to eat at "new" spanish restaurant that isn't all about the technology. Not that I don't love what they're doing over at the Casino, ala Adria, but it's also good to be reminded of spanish flavors, just combined in different ways. That cod is sensational! dwedit drawings of sir lancelot and guenavier auguste rodin mcafee rebate processing resubmission department constitution avenue and washington d.c.